Progressive Commerce's Channel Managersmenables clients to view up to the second sales data based on the type of credit used in each transaction. Progressive Commerce employs extensive fraud control measures that give your business solid protection and peace of mind. Every order transaction is validated prior to shipment using specialized processes and triggers that have proven highly effective in detecting and dealing with fraudulent order attempts. Our Accounting Services department can provide experienced ongoing guidance and recommendations that can greatly reduce fraudulent order costs. Critical to the success of your business is the ability to execute customer billing and collect proceeds on a timely and accurate basis. 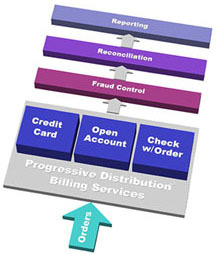 Progressive Commerce provides a wide array of accounting and billing services, whether to consumers or businesses, as a tightly integrated step of the order/sales cycle.